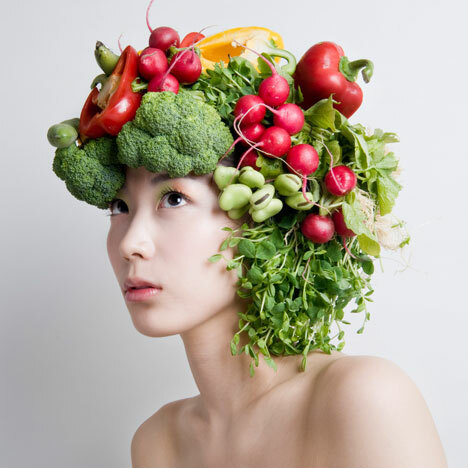 Japanese artist Takaya adorns the heads of models with raw vegetables and blossoming flowers. The artist affixes the clusters of plants to styled hair, just like a florist would arrange a bunch of flowers, before pruning them with hairdressing scissors. This unusual form of decoration is used for both live performances and weddings. Another story about strange hairdressing that we've published features huge bonnets made of plaited hair - see our earlier story here. You can also see all of our stories about fashion here. The one who ties together flower and person, HANAYUISHI. Born in 1975, Takaya started out in the world of culinary and in 2004, he started his work as a Flower Artist in Kyoto. Using only fresh flowers, he invented an original technique of art in the field of hair dressing, tying together people and flower. As a HANAYUISHI, he worked with many wedding occasions, live performances and media companies like NHK. For every face and every dress, every proposal is tailored to fit that one individual. Unthinkable design for the infinite future are also greatly supported.